I welcome you today to Series 4 – The Candy Wrapper Chain#4, the finale! To see previous posts, check out Series 4 on the Series page. As usual, today’s craft, the cracker box bracelet, comes to you straight from the recycling bin, the best place to shop for craft supplies in my opinion. As its name suggests, it is made from a cracker box, plus I’ve given it a little “je-ne-sais-quoi” by topping it with painted egg carton bits which you may or may not recognize from here. If you want to take a cracker at it, look no further! 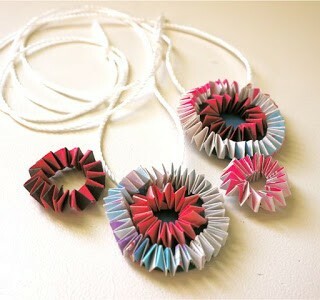 I used the same method outlined here to create the bracelet chain. 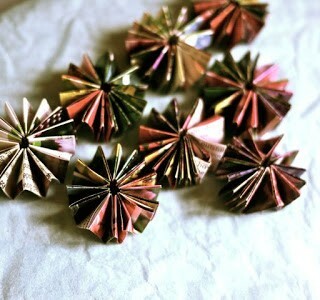 Only, instead of telephone book pages or junk mail, I made the links out of a painted cardboard cracker box. The links are also significantly smaller: 3/16″ (4 mm) wide and 2-1/4″ (5.6 cm) long. Note: I must tell you that this bracelet was not easy to put together. If I were to make another one, I would think twice before using cardboard. Because each link is so small, its thickness and rigidity when folded makes it hard to work with. 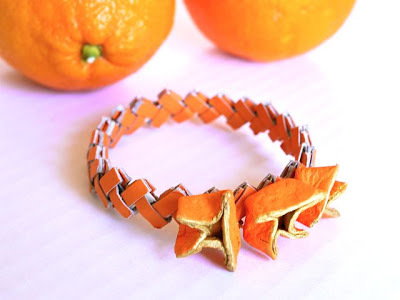 The bracelet material should remain flexible even when folded on itself. 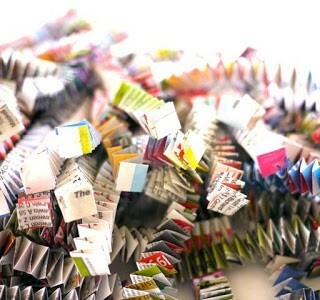 I suggest making your links out of junkmail or some such recyclable paper, folding each link the way Gary Dushl does with gum wrappers in his video tutorial. That said, the cracker box did make a very solid and pretty bracelet. The niftiness of its construction becomes quite apparent with the use of the thicker cracker box cardboard too. It’s just a bit challenging to link together and definitely requires patience. 1. 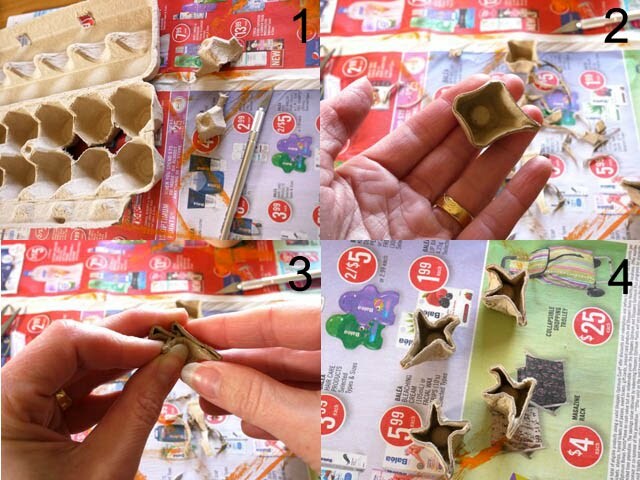 Cut out the center square bits of your egg carton using an Exacto knife. 2. Trim the edges of the cut-out bits. 3. Smoosh the corners of the cut-out bits between your fingers. 4. Repeat 1-3 a few times. In the end, I used only three egg carton cut-out bits. 5. Give your cut-out bits a primer coat. I used gesso but white acrylic paint would do the trick nicely. Let dry. 6. 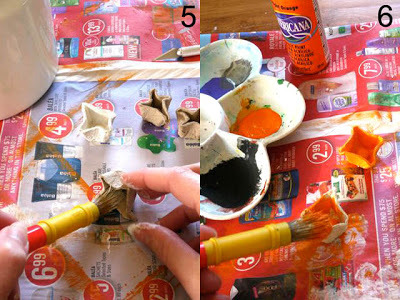 Paint them with orange liquid acrylic paint – or whatever colour you wish – all over. Allow to dry. Apply a second coat of paint. Allow to dry. 7. (not shown) Paint the edges with a few coats of metallic acrylic paint. 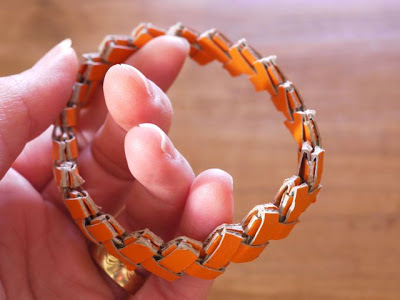 When dry, glue the egg-carton doo-hickies onto the bracelet. To make your bracelet super-strong and long-lasting, coat it a few times with varnish or Mod-Podge. And there you have it, your very own, cracker box bracelet! 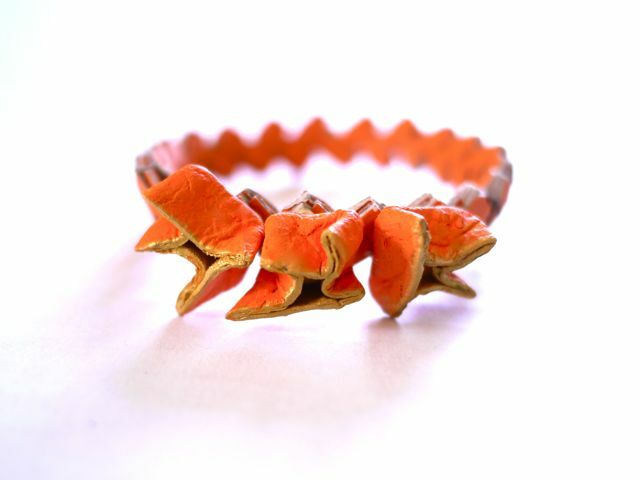 A dandy thing about this bracelet is that, to a degree, it is elastic! When I slip it over my hand, the links will lengthen. But I can then tighten it up around my wrist again by pushing the links close together once more. Isn’t that sweet?… I say! Now please, enjoy your day, and I’ll see you again soon! 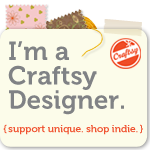 Linking to Get Your Craft On! Wow! This is magnificent! I can imagine how difficult it was to make it (having worked with egg carton before)and I admire your skills! The bracelet is truly unique! You should be told daily that you're a paper crafting & re-purposing genius, so brilliantly beautiful Michele! i also want to thank you (quite belatedly in fact) for your sincerely sweet comment on my take of your aeroplane garland & you may use the images or connect back to my post anytime you like 🙂 i want to apologize for my very very belated response but blogging & internet time have not been part of life's busy plan right now 🙁 but things are looking up in that department & my heart is singing!!!! 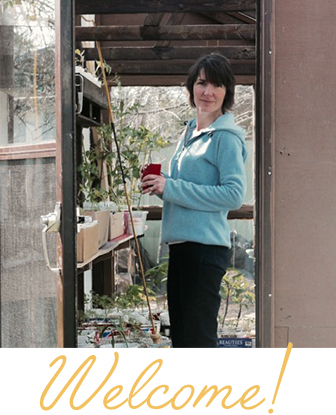 have really been missing the creativity outlet photograghy & blogging provide for me! Christine, that's great, I will probably be linking to your project very soon… And thank you so much for the kind comment! Really nice, Michele. When I first saw it, I thought the egg carton pieces were made from orange rind:) I had no idea you could make a chain like this with something as thick as a cracker box. Such interesting work as always. 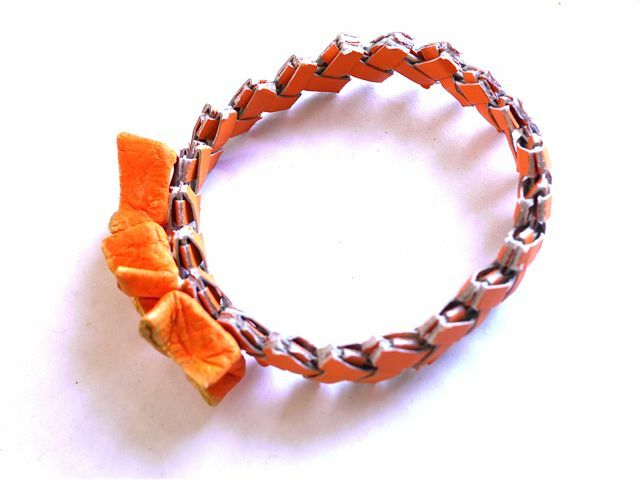 After all those gum wrappers, a bracelet does seem doable! Thanks for bringing back that memory.